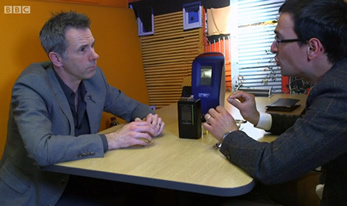 CFT’s Cardiovascular Diagnostics Capillary Technology Featured on BBC ‘Click’ Programme. A low-cost microfluidic fluoropolymer capillary film that possesses unique fluidic and optical properties to facilitate rapid, quantitative, multiplexed immunoassays for life sciences and clinical diagnostic applications, has been featured on the BBC’s technology programme “Click”. MCF™ (Micro-Capillary Film) has been developed by CAPILLARY FILM TECHNOLOGY LTD (CFT) a company with exclusive immunoassay know-how and IP (Intellectual Property) emanating from the University of Cambridge. The ‘Click’ programme on 7th May was a ‘medical special’ and focussed on the latest developments in personalised medicine. It demonstrated the unique fluid and optical properties of CFT’s microfluidic fluoropolymer film that make it ideal for rapid biomarker measurements and accurate diagnostics. CFT co-founder, Dr Nuno Reis explained in the programme, “Access to sensitive ‘point of care’ technology could make a big difference to the diagnosis of heart problems, cutting the time and number of patients who need to be admitted to hospital”. To watch the programme click here: http://www.bbc.co.uk/iplayer/episode/b079z98r/click-07052016 (16min 49 secs in). The device featured in the programme is used in conjunction with a smart phone camera to detect irregularities in blood samples, even at low levels, and is currently being tested by researchers at Loughborough University and the University of Reading. This research is being led by CFT’s co-founders Dr Nuno Reis and Dr Alexander Edwards. Dr Paul J Heaney, CEO of CFT, also notes that the company was a recipient of a £1.1M NHS sponsored SBRI programme to develop a desk-top version of the instrument for use in Accident & Emergency Departments. The instrument, called PICA-Cardiac is now in pre-production prototyping and subject to meeting IVD and CE regulatory approval could be available in NHS hospitals for testing patients with suspected heart attacks as early as the summer of 2017.